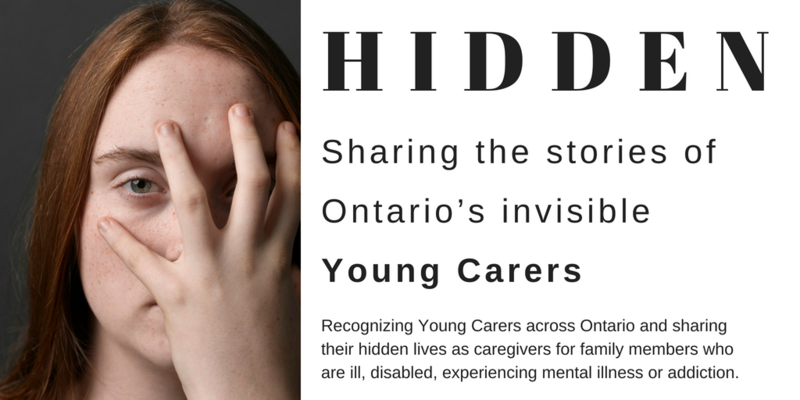 Hidden is a photo exhibition led and inspired by Hospice Toronto's Young Carers Program (YCP) that will show portraits of young carers living in Ontario and share their hidden lives as caregivers for family members who are ill, disabled, experiencing mental illness or addiction. Hidden shows the significant challenges that young carers face and the immense personal cost of their caring responsibilities. YCP hopes that this exhibition will mobilize awareness of young carers across Ontario and help to build networks and systems for identifying and supporting young carers and their families. We are incredibly proud to be able to support the amazing Hidden exhibition which brings these issues to light, gives young carers a voice, and works towards ensuring they have the support they need. The objective of the Hidden exhibition is to raise awareness of young carers both in Toronto and across Ontario by sharing and highlighting the stories of young carers through a photos taken by editorial photographer Max Alexander. The aim is to give young carers participating in the project confidence and a voice about their experiences, needs issues and aspirations. The Hidden exhibition is based on a concept developed by The Children’s Society, England, along with Photographer Max Alexander. The original ‘Hidden’ exhibition has been touring England since 2015 to raise awareness of the lives of young carers, and the hidden nature of these young people and their families. The ground-breaking Hidden exhibition was extremely successful in England, raising public awareness about young caregivers, and the issues and challenges they face and enabling increased support for them in schools, public services, programs and with the National Health Service. It has empowered the young carers who were photographed, and has directly influenced national policy and been a valuable resource for academia. It is hoped that this compelling portraiture exhibition will give moving insight into how being a young carer can affect a child’s well-being, education and life chances. More importantly, that it will also demonstrate how it can nurture hope, resilience and courage. Editorial photographer Max Alexander has photographed icons from the worlds of science, astronomy and politics, including Neil Armstrong, Stephen Hawking, Nelson Mandela, and Astronaut Tim Peake, for many prestigious organizations. ‘In this exhibition, I chose to portray these young carers as children and young people, which is what they should be. I wanted to show them as determined and resolute individuals, but vulnerable too. Their hidden stories then reveal themselves in their words.’ These character-based portraits will tell the human story of these remarkable children. Max Alexander has been a professional photographer for over twenty years, working for a large number of prestigious clients around the world, and has several high-profile exhibitions to his name. He has photographed young carers extensively for over fifteen years, and produced powerfully intimate portraiture for The Children’s Society. As well as his work with young carers, Max is well known for his work with science, and with astronomy in particular. He is the contract photographer for the UK Space Agency. In 2009 his portrait-led exhibition, Explorers of the Universe, was seen by over 100,000 people at the Royal Albert Hall, and had over two million related hits on his website. In November 2014, his Illuminating Atoms portrait series was shown at The Royal Albert Hall.